Energy efficiency has been referred to as a “hidden fuel”, one that extends energy supplies, increases energy security, lowers carbon emissions and generally supports sustainable economic growth. Yet it is hiding in plain sight: in 2011, investments in the energy efficiency market globally were at a similar scale to those in renewable energy or fossil-fuel power generation.The Energy Efficiency Market Report provides a practical basis for understanding energy efficiency market activities, a review of the methodological and practical challenges associated with measuring the market and its components, and statistical analysis of energy efficiency and its impact on energy demand. It also highlights a specific technology sector in which there is significant energy efficiency market activity, in this instance appliances and ICT. The report presents a selection of country case studies that illustrate current energy efficiency markets in specific sectors, and how they may evolve in the medium term.The energy efficiency market is diffuse, varied and involves all energy-consuming sectors of the economy. A comprehensive overview of market activity is complicated by the challenges associated with quantifying the components of the market and the paucity of comparable reported data. 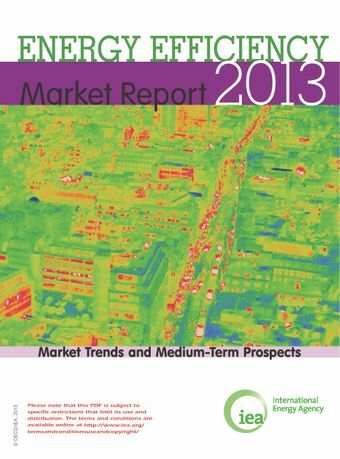 This report underscores how vital high-quality and timely energy efficiency data is to understanding this market.This first Energy Efficiency Market Report sits alongside IEA market reports for oil, gas, coal and renewable energy, highlighting its place as a major energy resource. It summarises in one place the trends and prospects for investment and energy cost savings in the medium term, up to 2020.This Report joins the IEA market reports for oil, gas, coal and renewable energy, highlighting energy efficiency’s place as a major energy resource. It summarises the trends and prospects for investment and energy cost savings in the medium term, up to 2020.